Following a healthy low-carb diet can help you shed excess pounds -- but if you're not careful, you might notice your bank account looking a little smaller, too. That's because carbs are relatively inexpensive sources of energy, and filling your cart with lots of fresh meat and produce can seriously increase your grocery bill -- especially if you're eating organic. Low-carb dieting doesn't have to break the bank, though. Opt for less expensive low-carb foods, and use cost-saving tips when you're shopping for pricier produce. You already know that veggies make up the foundation of a low-carb diet, but fresh produce can get costly, especially if you're selecting produce that's out of season. Save your cash by reaching for frozen veggies whenever possible. They're flash-frozen at the peak of freshness, so they offer the same health benefits as fresh vegetables, and they're available at a relatively low price year-round. And because frozen veggies have a longer shelf life than their fresh counterparts, you'll waste less money via food waste. Stick to fibrous veggies -- a group that includes lower-calorie veggies, including spinach, broccoli and cauliflower -- to keep your carbs low. One-third of a 10-ounce package of frozen broccoli, for example, has just 2 grams of net carbs -- the type of carbs that get digested and increase your blood sugar. A cup of frozen cauliflower has just 3 grams of net carbs, and a serving of four frozen asparagus spears supplies just 1 gram. Stop by the nut butter aisle, and you'll find a wealth of budget-friendly staples that fit into a low-carb diet. A 2-tablespoon serving of peanut butter, for example, has 4 grams of net carbs -- and all-natural varieties made without any added sweetener may be even lower in carbohydrates. And thanks to peanut butter's long shelf life and small serving size, a relatively inexpensive jar of peanut butter will last you for several meals, meaning it has a low cost per serving. While other nut butters tend to be slightly pricier than peanut butter, they're still an economical addition to a low-carb diet. Two tablespoons of almond butter, for instance, have 3 grams of net carbs, while an equivalent serving of cashew butter supplies 8 grams. While meat is a great source of protein, it can also be pricey. Instead, reach for eggs and dairy as inexpensive low-carb sources of protein. 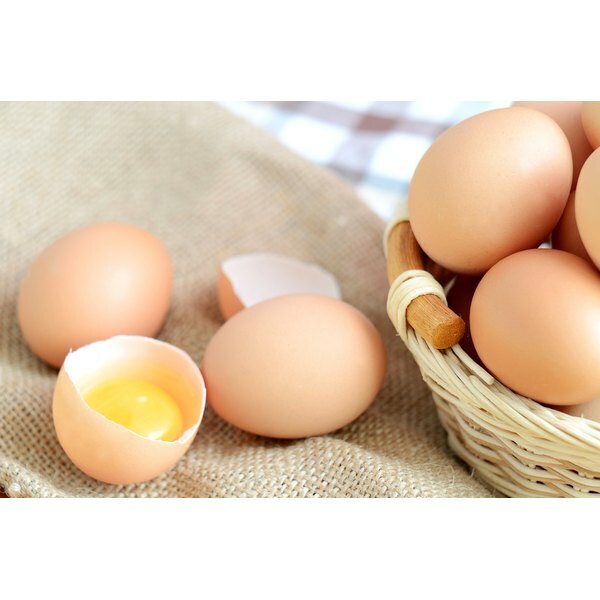 Each large egg contains less than a gram of net carbs but supplies over 6 grams of protein. Their relatively long shelf life in the fridge means you'll lose less money through food waste, and their versatility in the kitchen prevents boredom, so you won't get sick of this low-carb staple too easily. In the dairy aisle, reach for Greek yogurt for low-cost protein. Each 6-ounce serving of unsweetened Greek yogurt has 6 grams of net carbs and 17 grams of protein. Buy a big container of Greek yogurt and use low-cost flavorings -- like ground cinnamon, pumpkin spice mix or frozen berries -- to add flavor. If you're on a more permissive low-carb diet -- meaning you can eat 40 or more grams of carbs per day -- stock up on legumes, like lentils, as a source of protein. One-half cup of cooked lentils contains 12 grams of net carbs and 9 grams of protein, and costs just pennies per serving. Save extra money by buying dried lentils, instead of the slightly more convenient, but costlier, canned version. While you'll save the most money by buying cheap low-carb foods, you can also plan ahead to save some cash on costlier low-carb staples. Stock up on meat when it's on sale, and freeze single servings in freezer-safe bags to avoid spoilage. Take your portion out of the freezer the night before, add your marinade of choice to the freezer bag and allow to thaw in the fridge overnight. Use cheap foods to extend your use of costlier ones -- instead of topping your salad with 3 ounces of chicken, for example, top it with 1 ounce of chicken, shredded cheese and an egg. Avoid packaged foods, including precut veggies and packaged salads, since these often have a higher cost per serving than veggies you prepare yourself. And save costs by combining fresh and frozen veggies -- for example, topping a fresh spinach salad with sauteed frozen veggies, instead of using only fresh produce in your salads.